would this song have gotten Robert Nesta Marley "protested"? What about the cover the original cover of the record Confrontation showing Rasta on the back of a White Horse driving a Joust through the heart of a Dragon wearing a "Pope Hat"...sorry don't know what thing is called. Not trying to start contreversy just more so wondering how the most "marketable" name in the history of reggae would be recived today in the "marketplace"
the Marley name seems to be INVINCIBLE. ...or some people have to work and can't respond right away, geeze. Is Marley talking about hanging gay people from trees or shooting them in the head? No. Another attempt to justify murder music. And no, I don't agree with bombing a church, shooting a sheriff, or hatred against Catholics . Unlike many on this forum, no artist or music is so important to me that I would sacrifice my principles so I can listen to music. PS Just to be clear- I have already said a few times I support an artist's right to sing hate music. I support your right to listen to that music. I also support the right of the gay community to stand up for their rights as well and use economic and political pressure as tools of protest. I also support my rights to keep fighting for equality for humanity, whether on this forum, at a parade, not supporting these artists with my money, voting or just talking to people. I have expressed all my opinions in this post, so I am TRULY done. The horse has been beaten, has died, and needs to be buried. Edited 1 time(s). Last edit at 10/15/2012 10:00PM by J_72. midnite ravers has nothing to do with partying or cross dressing..
Edited 2 time(s). Last edit at 10/15/2012 10:27PM by bigvein. Edited 2 time(s). Last edit at 10/15/2012 10:14PM by J_72. How many tunes does an artist have to record with "hate lyrics" for ALL of his music to be considered "hate music"? Or is it even one offensive line or verse that makes that artist a "hate artist"? Edited 1 time(s). Last edit at 10/15/2012 10:24PM by Original RuffNeck Sol Jah. Your critical reading skills are seriously lacking Sir. 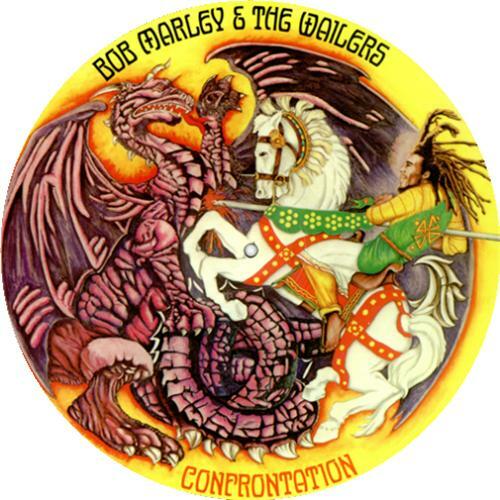 What about the original cover of the record Confrontation showing Rasta on the back of a White Horse driving a Joust through the heart of a Dragon wearing a "Pope Hat"
Pope hat? Am I missing something, or was the artwork changed? I thought the dragon was a representation of Babylon. Yeah I've never seen the cover with the dragon wearing a "pope hat." 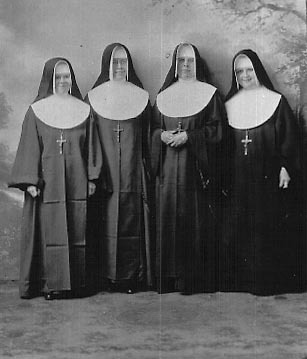 By the way, catholic high school has taught me that type of hat is called a mitre (I think). Whatever its called, I don't see it. I believe the original pic had a pope hat, but it was taken off to make it more marketable. Not sure where I read that. ORSJ, I am done, as I stated, and summarized my thoughts in my post. I will leave it at that. Is Marley talking about hanging gay people from trees or shooting them in the head? No. Another attempt to justify murder music. 2) It is meant to be Babylon...Rasta the Catholic Church with Mystery Bablyon the Plauge of Nations. "Can't tell the woman from the man....they are dressed in the same pollution. There minds are confused with confusion so to their problem seems there's never no solution"
If this aint the club then I don't know what he is talking about. I guess my point is no one should confuse that fact that Bob was a Rasta Man. He felt the same way Capleton does about of lot of these issues. The difference is that (IMO) the music he made was free of that message and was/is for everyone. He felt the same way Capleton does about of lot of these issues. Please show me a scintilla of evidence that Bob Marley felt that gays should be "String dem up and hang dem up alive", or where bob stated that gays "mi shot up" or that bob stated gays "fi get killed." Now that we've divided into teams, when are we gonna play kick ball? Daniel I never mentioned Gay people in my original post. Not once. I was asking who is sticking up for the Catholics? Gay's aren't the only group of people who are subject to persecution. 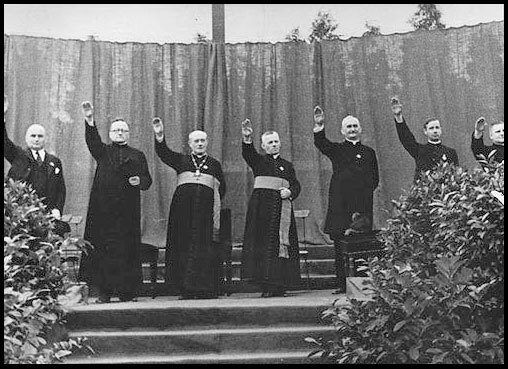 No one mentioned that Catholics were/are one of the main targets of the Ku Klux Klan. Should Mitt Romney come out with an add that shows him on the back of a white horse driving a joust through the heart of a dragon wearing the clothing of an Imam I have no doubt in my mind that he would be considered to be "advocating violence" against Islam. I am saying in a "LARGE nutshell" that we support those we like and come up with reasons to see it their way. When we don't we simply don't. would this song have gotten Robert Nesta Marley "protested"? Pretty open to interpretation depending on where your sensitivities rest. Considering his animosity towards "Babylon" and the Catholic Church that line could be interpreted as talking about Priests and Nuns. Personally, I always took it to mean Vanity or Riches were the "dressings" and the "confusion" was Desire and Greed (All tools of the Babylon System). The 10,000 Chariots/Riders who cover their faces are the righteous who have no need to be recognized or individualized in the midst of a "Musical Stampede" "Where EVERYONE is doing their thing"
While Bob certainly had strong beliefs, I think what made him so accepted was his ability to appeal to universal struggles and not FORCING others to see things his way or believe what he believed. Probably why the choice was made to literally tone done the "Confrontation" LP cover. Bob had his faults and in the midst of today's "YouTube Comment" mentality I'm sure he would be criticized for something. Edited 1 time(s). Last edit at 10/17/2012 09:25PM by nahikuroots. Edited 1 time(s). Last edit at 10/19/2012 10:29PM by norcaljahman. I have made the same observation NCJM, The obvious difference is being a "soundbwoy" is a choice ;-) The underlying conundrum is that while most people advocate "non-violence", what they really mean is non-violence towards themselves or people they care about. Most people still enjoy seeing a bully get there comeuppance. It is a reality of life that we may tell our children not to solve their problems with violence while we have things like Professional Sports & The Death Penalty. It should be no surprise that we resort to tactics of aggression when we struggle to get what we want.